Antipater’s poem, above, is the earliest intact list (2nd-1st centuries BCE): (1) the city wall of Babylon; (2) the sculptor Pheidias’ statue of Zeus, in the temple at Olympia, on the river Alpheius; (3) hanging gardens, of uncertain location (usually Babylon) (correction:) at Babylon; (4) the ‘Colossus’, an enormous statue of the sun god Helios on the island of Rhodes (correction:) in the city of Rhodes; (5) the pyramids at Giza; (6) the tomb of Mausollus, or ‘Mausoleum’, at Halicarnassus; and (7) the temple of Artemis at Ephesus. But different lists exist. They shuffle the sequence, they have many substitutions. Pseudo-Hyginus leaves out the hanging gardens, and puts the palace of king Cyrus at Ecbatana in its place. Let’s not spend time on all of the wonders. Before we look over a select few, I’d better confirm that this post was originally inspired by the recent announcement of a fascinating discovery at the Great Pyramid of Khufu at Giza: scientists used muon tomography to discover a large void in the middle of the pyramid. It’s a terrific discovery, but I don’t have any special insights myself: nothing I say here has any bearing on it. ‘The Great Lighthouse’, one of the wonders in Civilization VI (Firaxis Games, 2016): +1 to ship movement, +3 gold, and +1 Great Admiral point per turn. If you like that sort of thing. 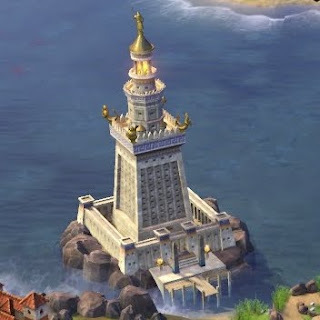 The lighthouse of Alexandria doesn’t appear in any ancient list of the seven wonders. Oh, it existed. It just wasn’t one of the seven wonders. This is contrary to what you may read in the New Pauly, or the Britannica, or Wikipedia, or the Ancient history encyclopedia. (The Oxford classical dictionary gets it right, though.) If you go and read the sources these encyclopaedias cite -- where they do cite any, that is -- you will find not a single mention of the lighthouse, nor any reference to the island of Pharos that the lighthouse was named after. Conversely, if you read up on the Pharos -- for example, the description in Strabo 17.1.6, or Pliny the Elder’s Natural history 36.83-- you will find no mention of a list of seven wonders. Now, this bald statement does need some qualification -- but only a little. Pliny’s description of the Pharos is embedded in an account of a couple of dozen remarkable constructions, of which two or three others are normally considered to be among the canonical seven wonders (the pyramids of Giza, 36.75-76 and 78-82; Pharos, 36.84; hanging gardens of Egyptian Thebes -- not Babylon! -- 36.94; temple of Artemis at Ephesus, 36.95-97). You could call this a kind of a list of wonders, but it’s certainly not ‘seven’ and there’s only a partial overlap with ancient lists of a canonical seven. An anonymous poem in the Greek Anthology (9.656) listing: the palace of emperor Anastasius in Constantinople; the ‘Capitolian hall’ (not hill) in Italy; the ‘Rufinian grove’ at Pergamon; the temple of the deified Hadrian at Cyzicus; the pyramids; the Colossus of Rhodes; and the Pharos. Gregory of Tours, On the course of stars (preface): Noah’s ark; the wall of Babylon; the temple of Solomon; the tomb of a Persian king (presumably Mausollus. who was a Persian satrap); the Colossus of Rhodes; the theatre of Heraclea; and the Pharos. (ps.-? )Bede, On the seven wonders: the Capitolium of Rome; the Pharos; the Colossus of Rhodes; a statue of Bellerophon suspended in air (unknown location); the theatre of Heraclea; a heated bath (unknown location); temple of Artemis. Why did the Pharos make its way into these late lists? That must surely be because the ancient canon had mostly been destroyed by that time. Only the Mausoleum (destroyed by earthquake in the early mediaeval period) and the pyramids were still standing. The Pharos remained in operation until the 12th century. Now, that doesn’t explain why these lists continued to include some long-lost structures: maybe the Colossus and the temple of Artemis owe their continued presence in the lists to their sheer memorability. 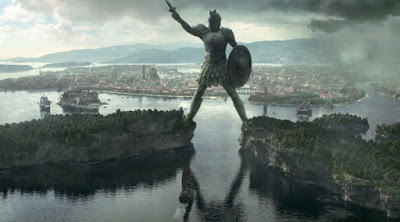 The Colossus was a statue of Helios (the sun), made by Chares of Lindos, which collapsed in an earthquake around 226 BCE, less than a hundred years after it was built. It’s popularly imagined as standing astride the harbour entrance at the port of Rhodes. But that’s a complete fabrication, dating to the early modern period. Even so, that’s how George R. R. Martin imagines it when he parodies it in his A Song of Ice and Fire books -- and if it’s good enough for Braavos, then by golly it must be good enough for Rhodes! Just in case you weren’t sure Martin was taking inspiration directly from ancient Rhodes, we’re told that the Titan is one of a canon of nine ‘Wonders made by man’. The thing is, George Martin does get a bit over-excited about imagining ancient edifices as being really really big. Strabo, Geography 14.2.5: quotes a poem (presumably 3rd cent. BCE) putting it at 70 cubits, or 32.3 m.
pseudo-Hyginus, Fabulae 223: 90 feet high, or 26.6 m.
Pliny, Natural history 34.41: 70 cubits high, or 32.3 m.
Philon of Byzantium (ca. 4th-5th century CE; not the same person as the 2nd cent. BCE mechanical writer), On the seven wonders 4: 70 cubits, or 32.3 m. (Pseudo-? )Bede, On the seven wonders: 136 feet, or 40.2 m (if we reckon in Roman feet). There’s no doubt that 70 cubits was the canonical figure. Ps.-Hyginus’ figures are untrustworthy, as we’ll see below, and Bede had no access to any better information than the ancient sources did. Even if the 70 cubit figure was exaggerated -- which is likely -- the statue was probably still around 30 metres high. For comparison, the Statue of Liberty is 46 metres high (from feet to torch). The modern harbour entrance at Rhodes is about 150 metres wide. Ancient triremes needed about 12 metres horizontal space (with oars). Even if the statue was getting on for 40 m high, which it wasn’t, its feet could hardly have been more than 10 metres apart. At 32 m, we’re talking more like 8 m apart. And that’s if it’s doing a really good stretch. In actual fact there’s nothing to suggest it was even located at the harbour, let alone standing astride the harbour. The whole scenario is hogwash. Pliny reports that ‘it is a marvel even lying down’, and talks of visitors seeing the places where the limbs became detached and trying to put their arms around one thumb. In other words: when it collapsed, it fell on land. The pyramids in Egypt where no shadow is visible; 60 feet high. A couple of problems here. First the height; second, the absence of shadows. They’re both wrong. But it turns out that neither of these elements is unique to ps.-Hyginus. Ps.-Hyginus’ figure, 60 feet, in Roman feet comes to 17.7 m, which is much too small. Then again, Philon’s On the seven wonders (4th/5th cent. CE) gets it wrong too: Philon reports the height as 300 cubits (133 m, converting using Roman feet), and the circumference as 6 stadia (278 m per side). The actual figures for the Great Pyramid are 146 m high and 230 m per side. Philon is at least in the right order of magnitude, unlike ps.-Hyginus ... but it does show that accurate figures for the pyramids’ size were not well known. Now, ps.-Hyginus and Lucian can’t possibly be thinking of pyramids that were shadowless even at sunrise and sunset. That’s geometrically impossible. 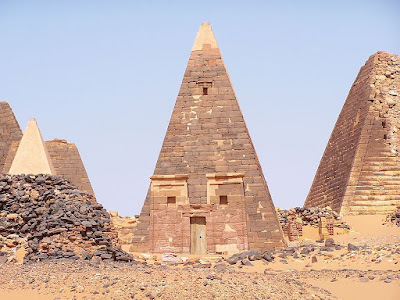 They must mean pyramids that were shadowless in the middle of the day, especially at midday -- because in antiquity, shadow measurements regularly refer to gnomon readings taken at midday. In summer, the Great Pyramid is indeed shadowless at midday. But not all year round: only for eight months or so. In antiquity, the earth’s axial tilt was 23.8° (slightly greater than the present-day figure of 23.4°), and the Great Pyramid is at latitude 30.0° N; that means that at the winter solstice, the sun’s midday altitude was 36.3°. (Yes, there’s a rounding error in there.) But the slope of the Great Pyramid is 51.9°. Result: shadow. It’s futile to go looking for alternative pyramids to suit ps.-Hyginus’ report, because there are no good candidates. Pyramids in present-day Egypt are all in the north, with none south of the Fayum, so the difference in the sun’s height at midsummer isn’t nearly great enough to matter. The Nubian pyramids at Meroë, in what is now Sudan, about 200 km north-east of Khartoum, are much further south -- the sun reaches 49.3° above the horizon in midwinter -- but they still get shadows, because they’re much steeper than the Egyptian pyramids (about 70°, as compared with the usual Egyptian angles of 40-50°). 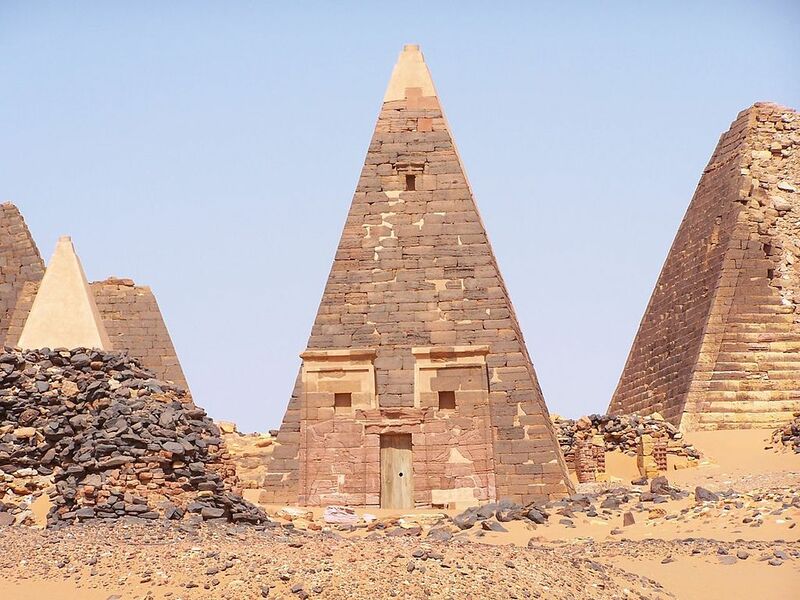 If an Egyptian-style pyramid were built at Meroë, it could easily have no midday shadow all year round; but Nubian-style pyramids are just too pointy. Besides, pretty much every other account of the pyramids makes it clear that they’re talking about the pyramids at Giza. If there’s anything at all to the claims in ps.-Hyginus and Lucian, they must have been thinking of pyramids that are shadowless in limited circumstances: between the spring and autumn equinoxes, at most, and only in the middle part of the day. The length of the ascent makes it tiring to travel up there, and standing on the peak makes people’s vision darken when they look down at the drop. Modern visitors aren’t allowed to go climbing up the pyramids. The penalty is three years in prison, if you’re interested. But ancient tourists could. It seems plausible that looking down 146 m, with no shadows in any direction, could have been disorienting and disturbing. The modern lawbreakers who scale the Great Pyramid every few years don’t get to see this, because they have to do it under cover of darkness. Brodersen, Kai 2006 . Die sieben Weltwunder. Legendäre Kunst- und Bauwerke, 7th ed. Munich: C. H. Beck. Clayton, Peter A.; Price, Martin J. (eds.) 1988. The seven wonders of the ancient world. London/New York: Routledge. Roscher, W. H. 1906. Die Hebdomadenlehren der griechischen Philosophen und Ärzte. Abhandlungen der philologisch-historischen Klasse der königl. Sächsischen Gesellschaft der Wissenschaften 24.6. Leipzig: Teubner. pp. 186-193. The earliest list, but incomplete, is in the Laterculi Alexandrini, partially preserved on Berlin papyrus 13044 v (late 2nd century BCE) at column 8. Preserved entries: temple of Artemis, pyramids, Mausoleum. Antipater, Greek anthology 9.58 is the earliest complete list; the same items appear in a different sequence in Greek anthology 8.177; and an incomplete text, Philon’s On the seven wonders (4th/5th cent. CE) is missing the seventh wonder but is otherwise consistent with the two poems. Wall of Babylon; statue of Zeus; hanging gardens; Colossus of Rhodes; pyramids; Mausoleum; temple of Artemis. Philon breaks off before getting to the Mausoleum. These are the only full lists to include the ‘hanging gardens’, but none of the three mentions its location. Pliny Natural history 36.94 places the hanging gardens at Egyptian Thebes, i.e. Luxor; Strabo 16.1.5 places the gardens at Babylon, specifying that they are considered to be among the seven wonders; Gregory of Nazianzos’s reference to Thebes (see below) may support the Egyptian setting. I’ve now made a new post (July 2018) with better information on ancient testimony for the hanging gardens. See here. Two more lists which are identical to one another (and in the same sequence) appear in ps.-Hyginus Fabulae 223 and Cassiodorus Variae 7.15. Mostly the same as Antipater, above, but they omit the hanging gardens, and include the palace of Cyrus. Only these two lists include the palace of Cyrus. Cassiodorus adds the city of Rome at the end, as an ‘eighth wonder’. Gregory of Nazianzos, Oration 43.63 (xxxvi.580 Migne) lists six works, of which four or five also appear on the earlier lists: Thebes in Boeotia; Thebes in Egypt (a reference to the hanging gardens? ); walls of Babylon; Mausoleum; pyramids; Colossus. Late antique and early mediaeval sources start to give very different lists, which typically share only two or three items with the ancient lists: Greek anthology 9.656; Gregory of Tours On the course of stars, preface; (ps.-? )Bede On the seven wonders; and many more. For more mediaeval examples see Brodersen 2006. References outside lists. Diodorus of Sicily’s Library refers to two edifices ‘numbered among the seven most famous works’: the Great Pyramid (1.63.2, 18.4.5); an obelisk at Babylon (2.11.4-5). Propertius 3.2.17-26 states that the longevity of his poetry is greater than three items conventionally related to the canonical seven: pyramids; temple of Zeus at Olympia; Mausoleum. Pliny, Natural history 36.64-100, lists numerous ‘wonders’, including three that normally belong to the canonical seven: pyramids (36.75-76, 78-82); hanging gardens of Egyptian Thebes (36.94); temple of Artemis (36.95-97). Elsewhere he describes the Colossus (34.41), in the middle of a discussion of many colossal statues. Martial, On spectacles 1.1, lists six items of which four normally belong to the canonical seven: pyramids; wall of Babylon; temple of Artemis; altar of Apollo at Delos; Mausoleum; Flavian amphitheatre (Colosseum). Strabo’s Geography names five items, separately, stating that they belong to the seven: Colossus (14.2.5); Mausoleum (14.2.16); wall of Babylon (16.1.5); hanging gardens of Babylon (16.1.5); pyramids of Khufu and Khafre (17.1.33). He appears to cite the last as two separate wonders. John Malalas, Chronography 11.16 (279 Dindorf), names the temple of Hadrian at Cyzicus as ‘one of the wonders’. This post doesn’t stick to the usual subject-matter for this blog. 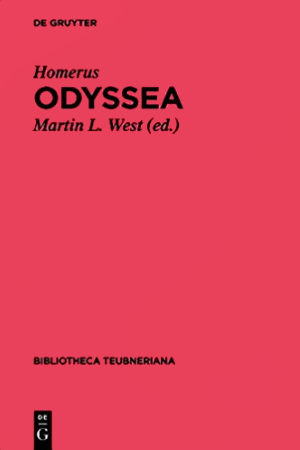 An important new critical edition of a very important book has come out recently, and it’s a book that is very dear to me: one of the two great Homeric epic poems, the Odyssey. So, with apologies for doing stuff that is going to be uninteresting for general readers, I give here a few notes about this new edition by the late lamented Martin L. West (Homerus. Odyssea, Bibliotheca Teubneriana, De Gruyter, 2017). There’s no doubt this Odyssey is a major achievement, just as West’s Iliad was. For the mass of papyrological material alone, it is an essential edition for any serious student of Homeric epic. But West’s practices do sometimes ring alarm-bells, for those who don’t quite know what he’s doing -- sometimes even for people who do understand what’s going on. A few days ago there was a minor twitterstorm when this tweet appeared from the Twitter account of the blog sententiae antiquae, surprised that even the first lines of the poem looked weird. A couple of days later they summed up the subsequent discussion on Storify. In the context of that conversation I started doing a reasonably systematic investigation of the text. (I’ll admit in advance that I didn’t have access to West’s previous book The making of the Odyssey over the weekend; so I’ve been trying to avoid being judgemental.) Some of the fruits of that investigation I posted on Twitter; I’m using this post to give further details. I started drawing up a detailed list of textual divergences between West and earlier editions, but it quickly became obvious that while West does often choose his manuscript readings idiosyncratically, he does not make changes that spring solely from assumptions about poetics. To put it more bluntly: he selects, but he does not make stuff up. In that respect he is rigourous. And he does not make mistakes easily: I have yet to find anything that I am sure is an error in this text (though there are some points that puzzle me mightily). West has very, very many textual divergences from the manuscript tradition, but nearly all of them are caused by linguistic considerations, all of which come from his ideas about (a) Greek dialects; (b) textual transmission in the 7th-5th centuries BCE; and (c) the circumstances in which the text was written down. So I will not give a catalogue of the divergences: neither the major ones, nor the orthographic quirks. However, West also deletes and brackets many lines -- 76 deletions, 101 bracketings -- and, broadly speaking, these decisions are not driven by the same considerations. These may be considered independently of his linguistic policies about readings and orthography. Below I give a catalogue of West’s deletions and bracketings, as an aid for anyone investigating his text. I assume that his decisions are driven by (a) papyrological evidence, and (b) ideas about the poetics of the Odyssey. But the second category: there I am much more suspicious. In particular, West deletes or brackets some lines even when they are unanimously supported by both ancient and mediaeval evidence: these account for 5 deleted lines, and 10 bracketed lines. Another 48 lines are bracketed because of modern editorial choices -- without direct support from ancient evidence, but also without any discrepancies in the mediaeval tradition. I suggest that any reader of the Odyssey in Greek would do well to pay very close attention to lines in these categories. Missing in multiple papyri: 2.407, 2.429, 3.78, 3.493, 4.783, 9.489, 9.547, 10.265, 15.113-119, 17.547, 18.131, 22.43, 23.48, 23.127-128, 24.143. Total: 22. Missing in one papyrus (including some where mediaeval support is dodgy): 4.57-58, 4.303, 5.91, 5.479, 8.27, 8.58, 10.253, 10.368-372, 10.504, 11.60, 11.92, 11.343, 14.369-370, 14.515-517, 17.565, 18.393, 18.413, 21.109, 21.276, 24.121. Total: 28. Mediaeval evidence only: 3.19, 4.432, 5.157, 8.303, 9.30, 10.430, 10.456, 10.470, 10.482, 10.569, 11.407, 12.140-141, 12.147, 15.63, 15.139. Total: 16. Doubtful or contradictory ancient evidence (again, including some where mediaeval support is dodgy): 2.191, 11.604, 13.347-348, 22.191. Total: 5. Deleted in spite of substantive ancient evidence supporting the lines: 6.313-315, 15.295, 17.49. Total: 5. Of these, 64 lines are also bracketed by von der Mühll. Von der Mühll keeps the other 12 without brackets: 4.303, 4.432, 5.479, 10.569, 15.113-119, and 17.547. Van Thiel has 20 brackets in common with West’s deletions: 2.191, 3.78, 5.91, 10.253, 10.265, 10.368-372, 10.430, 10.456, 11.92, 13.347-348, 15.63, 15.295, 21.276, and 23.127-128. Note that all of these are bracketed by both von der Mühll and van Thiel, and deleted by West. Missing in one papyrus: 2.393, *4.399, 9.55, 9.90, 10.101, 10.497-499, 17.62, 21.65-66, *21.219-220, 21.308. Total: 14. Ancient but missing/athetised in some ancient copies/critics: *1.148, 1.171-173, 4.276, *4.553, *5.84, 8.141, *9.483, *10.189, *10.315, *11.428, *11.525, 11.590, 12.441, 13.289, 14.159, *15.74, 17.181, 18.330-332. Total: 22. Disagreement among mediaeval manuscripts: 12.6, *15.345, *17.402, *19.153, 19.291-292, 19.466. Total: 7. Modern editorial opinion: 1.140, 1.238, 2.251, *3.131, 3.214-215, 4.246b-249a, 4.514-516, 4.519-520, 5.39-40, 7.255, 10.148, 13.192, 14.242, 14.258, 15.191-192, 16.286-294, 16.326, 17.399, 18.109, 18.254-256, 20.175, 20.256, 21.133, 22.442, 23.100-102, 23.157-158, 24.158. Total: 48. Modern editorial opinion in spite of ancient evidence supporting the lines: 12.332, 15.31-32, 15.298, 18.148, 19.236, 19.602, 22.274-276. Total: 10. 15 lines are bracketed by both von der Mühll and West. Of the 48 lines bracketed because of editorial judgement, without manuscript problems, only one judgement is shared by von der Mühll (3.131). Of the above list, only 1.148 is also bracketed by van Thiel. It is bracketed by all three editors. Particularly heavily hit in West’s edition are books 4 (5 deletions, 11 bracketings), 10 (13 deletions, 7 bracketings), and 15 (10 deletions, 7 bracketings). There is no overlap between West’s deletions/bracketings and places where analysts have levelled stylistic charges at the ‘Epilogue’ (23.297-24.548).